Henry Ford convinces Americans that cars are not ridiculous! 365 days a year Henry Ford’s mission was: How can I build a motor car? He was twenty-eight and had been building and experimenting with engines since he was twelve. Now, living in Detroit, he worked from 6:00 A.M. to 6:00 P.M. at an Edison plant. Evenings he was in his workshop building his first car. He had no holidays and no vacations, but he believed his work was all part of his learning and mission. His wife was sure he would succeed. He called her The Believer. Several people in Europe and the United States were on the same track, but Henry knew little about what they were learning. It was unfortunate, because projects to build a motor car, also called a horseless carriage, had begun almost a hundred years before Henry was born. By April 1893 Henry’s first car was completed. The car was made primarily from junk. Car parts weren’t sold, but he could buy iron for the frame. The spark plugs had to be made. The engine and car had to be light. The final weight was 500 pounds. People laughed at the idea of a horseless carriage. Few people knew that two hundred years earlier Sir Isaac Newton had proposed a car propelled by steam. Many sensible people believed a car would be a ridiculous form of transportation. Were they more ridiculous than camels, which were accepted as transportation by millions of people in the Middle East? 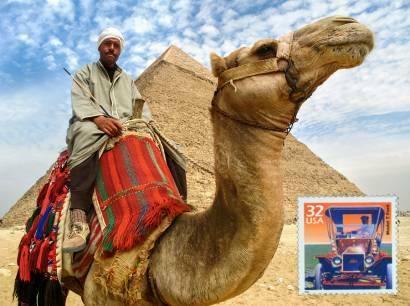 Camels and cars were unpredictable. Camels spit and kicked. The early Ford Model T car had a crank handle for starting the car. The handle had to be cupped in the palm with the thumb under the handle. If some poor soul put his or her thumb over the handle, instead of under and the engine did kick back, the instant reverse motion of the crank could roughly twist the wrist or break the thumb. Cars needed frequent refueling of gasoline and occasionally water and oil, but their storage capacity was inferior to a camel’s. Camels could eat grass or grains and go several days without fresh food or water. Fortunately, cars could keep improving, and Henry’s cars did. In 1899 he resigned from his job and went into the automobile business. His business took a bizarre twist when he was forced into car racing. People believed that cars could run, but they were too difficult to repair, unless you were a mechanic. However, the public was fascinated with the speed of cars. Henry became convinced that if he could build the fastest racing car in the world he would attract attention. Americans would buy Ford cars. Two of his racing car ventures became a legend! The Red Devil or “999” clocked 91:37 miles per hour January 12, 1904. The next month the Ford Motor Company was incorporated. By 1910 the results were phenomenal. Ford was using assembly lines and mass production with standardized parts to produce the Model T Ford car. Fifteen million were made in the U. S.
Henry Ford was the genius who brought together the knowledge and experience to offer a dependable, reasonably priced car that changed American life. This is Barbara Steiner with a landmark in American history. For more stories please check out thisweeksstory.com.